Automatically dispenses a continuous supply of dry food into a sturdy plastic base. 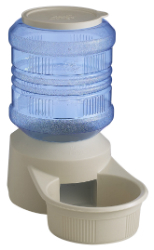 Removable cap on top of bottle makes refilling easy. Features a solid one-piece base design. For indoor and outdoor use.